There is a brouhaha underway about an American journalist who told a story about being in a helicopter in a war zone. The helicopter was hit and had to land. Which war zone and when I don't know. The US has created so many war zones that it is difficult to keep up with them all, and as you will see, I am not interested in the story for its own sake. It turns out that the journalist has remembered incorrectly. He was in a helicopter in a war zone, but it wasn't hit and didn't have to land. The journalist has been accused of lying in order to make himself seem to be "a more seasoned war correspondent than he is." The journalist's presstitute colleagues are all over him with accusations. He has even had to apologize to the troops. Which troops and why is unclear. The American requirement that everyone apologize for every word reminds me of the old Soviet practice, real or alleged by anti-communists, that required Soviet citizens to self-criticize. Having established that the journalist had actually stated that the helicopter was hit when in fact it wasn't, NPR brought on the program a psychologist at the University of California, Irvine, an expert on "false memory." The psychologist explained various reasons a person might have false memories, making the point that it is far from uncommon and that the journalist is most likely just another example. But the NPR presstitute still wanted to know if the journalist had intentionally lied in order to make himself look good. It was never explained why it made a journalist look good to be in a helicopter forced to land. But few presstitutes get to this depth of questioning. Now to get to the real point. I was listening to this while driving as it was less depressing to listen to NPR's propaganda than to listen to the Christian-Zionist preachers. In the previous hour NPR had presented listeners with three reports about civilian deaths in the break-away provinces in eastern and southern Ukraine. The first time I heard the report, the NPR presstitute recounted how explosives had hit a hospital killing 5 people in the break-away Donetsk Republic. The presstitute did not report that this was done by Ukrainian forces, instead suggesting that it could have been done by the "Russian-supported rebels." He didn't offer any explanation why the rebels would attack their own hospital. The impression left for that small percentage of informed Americans capable of thought is that presstitutes are not allowed to say that the Washington-backed Ukrainians attacked a hospital. But how can we help but believe the Russians? If all these Russian tank columns and troops that have allegedly been pouring into Ukraine were real, Washington's puppet government in Kiev would have fallen sometime last year, and the conflict would be over. Anyone with a brain knows this. So, we arrive at my point. A journalist told a harmless story and has been roasted alive and forced to apologize to the troops for lying. In the middle of this brouhaha, the US Secretary of State, the President of the United States, innumerable senators, executive branch officials, and presstitutes have repeatedly reported month after month Russian tank columns and troops entering Ukraine. 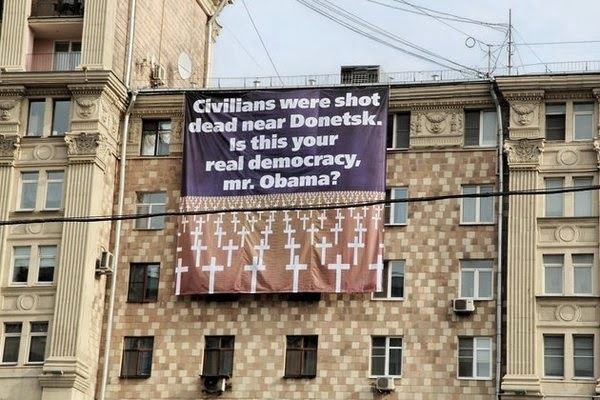 Yet, despite all these Russian forces, the civilians in the break-away provinces of eastern and southern Ukraine are still being slaughtered by Washington's puppet state in Kiev. So the question is: Why are the presstitutes all over some hapless journalist rather than holding accountable the Great Liars, John Kerry and Barack Obama? The answer is: It is costless to the presstitutes to try to destroy, for totally insignificant reasons--perhaps just for the pleasure of it, like "American Sniper" killing people for fun--one of their own, but they would be fired if they hold Kerry and Obama accountable, and they know it. But they have to get someone, so they eat their own. When Washington is not bombing and killing, it is plotting to overthrow reformist governments, such as the Honduran government Obama overthrew, and the Venezuelan, Bolivian, Ecuadoran, and Argentine governments that the Obama regime is current trying to overthrow. And, also, of course the democratically elected government in Ukraine that has been supplanted by Washington's coup. Washington and its fawning presstitutes branded the elected Ukrainian government that was a victim of Washington's coup, "a corrupt dictatorship." The replacement government consists of a combination of Washington puppets and neo-nazis with their own military forces sporting Nazi insignias. The American presstitutes have been careful not to notice the Nazi insignias. Ask yourself why a journalist's false memory episode of an insignificant event is so important to the American presstitutes, while John Kerry's and Barak Obama's extraordinary, blatant, blockbuster, and dangerous lies are ignored.